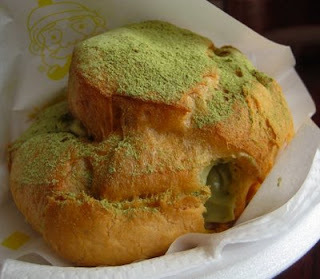 When I ask you about Japanese food, does pastry come to mind? 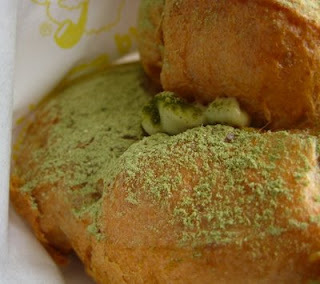 More accurately, choux pastry? Well, an entire franchise based on selling cream puffs sprouted from Japan. 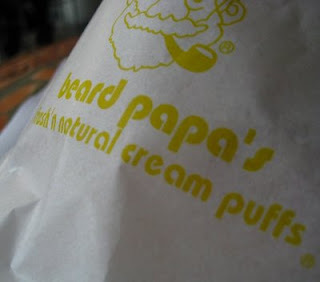 Beard Papa's has franchise locations all over the world, but sadly, none in Houston. 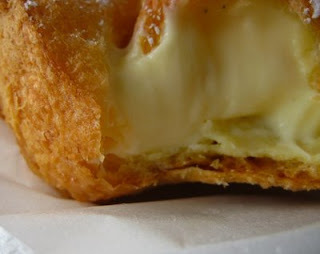 The basic cream puff is filled with vanilla pastry cream, and is best eaten in the store. I think I actually see vanilla seed flecks inside. But that's not all. Among the other flavors (they seem to rotate, although I don't think there are more than four at any one time) is this macha dusted green tea flavor. The delicate bitterness works with the sweetness of the pastry cream, although I think I much prefer the regular vanilla. I had these at the Sawtelle branch in Los Angeles.